Devoted Creations Award Winning Tingle formula just got upgraded! 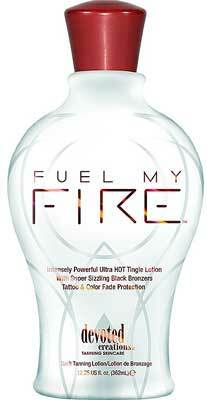 Fuel My Fire™ is guaranteed to turn up the heat! This revolutionary triple bronzing lotion is loaded with antioxidants and skin nourishing vitamins to hydrate, darken and protect the life of your tan. For a blazing bronzer hotter than you’ve ever experienced before – add some Fuel to your Fire!